The Zen Health & Wellness Centre offers complimentary healthcare with a difference in an inviting, calm and relaxing atmosphere. Holistic therapies can increase your energy levels, reduce stress, relieve pain, boost your immune system and improve your general well being and quality of life. We do not claim to cure - no one can do this apart from YOU. We merely facilitate healing to happen. Discover Zen's unique approach to health and wellness. Treatments are tailored to suit individual client needs, selecting from a range of the most effective treatments from East and West, age old and modern therapies. Our available treatments include Shiatsu, Reflexology, Aromatherapy Massage, Holistic Body Massage, Indian Head Massage, Spiritual Healing Reiki, Seichem and NLP (Neuro Linguistic Programming) for treatment of addictions, fears and phobias. Important Note: These treatments are not a replacement for medical advice or treatment from your GP or other medical professional. They are complementary to it. Used in conjunction with orthodox medicine they can support and often speed up the healing process. 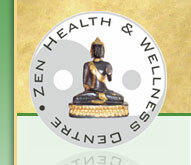 Balance your mind, body and spirit at the Zen Health & Wellness Centre - where prevention is better than cure.